Hey loves! Happy Spring! I don't know about you, but I am looking forward to warmer days, brighter colors, and lots of sunshine. 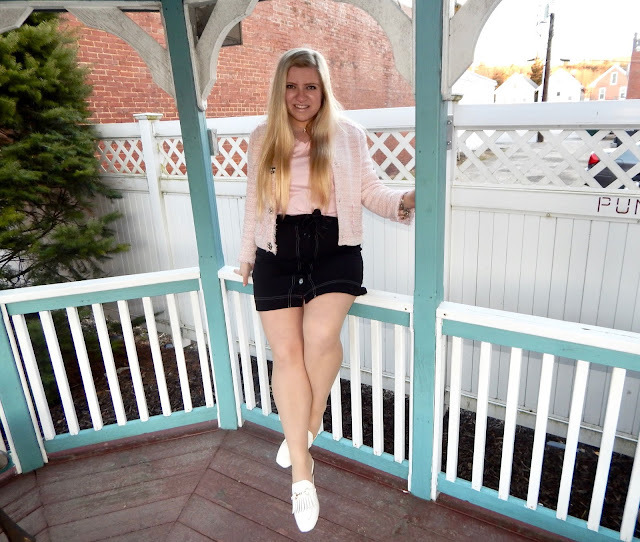 The weather around here is taking a little while to get in the spring spirit, but I wanted to style a transitional look that gets rid of the winter blues and says hello to spring hues! I love the springtime because it is like a rebirth, and it is always so refreshing. Honestly, I have not only had cabin fever, but a terrible sinus infection that hasn't had me feeling like myself for a while. Thankfully, after many prescriptions, my sinus infection is finally clearing up, and I actually feel like dressing up! It seems like everyone has been so sick and just can't shake it! I like to think that fashion is the best medicine because you only feel as good as you look, right?! 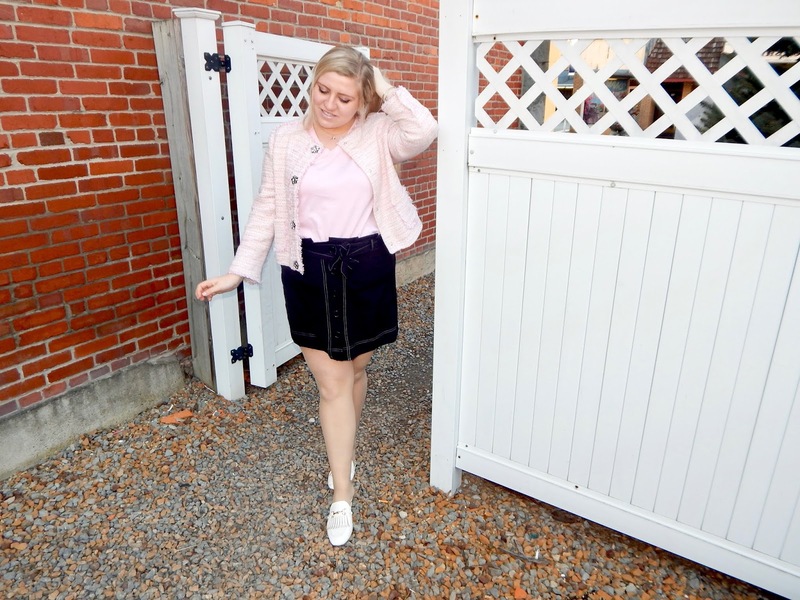 To celebrate the new season (and to say goodbye to flu season), I wore a pink tweed jacket, a pink tee, a black button front skirt, and some white mules. This look is perfect for this time of year because these pieces are all staples that can be worn in both warm/cool conditions. The mules and skirt give the tweed a spring refresh, but you can also throw on a fitted trouser and pump to make this a winter outfit. However, of course, we are focusing on all things spring in this post! Keep on reading to see how I style these fun pieces, and trust me, you will definitely be feeling a need for tweed! I have been wanting a tweed jacket for years because it is such a timeless, classy garment. It's a wardrobe essential that will not only forever be in style, but easy to style! Tweed is such a beautiful fabric because it is typically woven with with different colors, creating a visually interesting garment. Every time I think of tweed, I think of the one and only house of Chanel because they are known for their use of tweed in their designs. 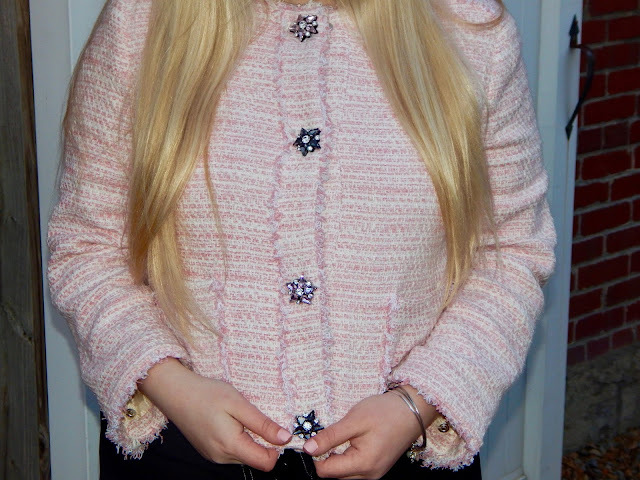 Being a babe on a budget, the stunningly crafted Chanel tweeds are a little out of my price range, but I ended up finding an affordable pink tweed that is exactly what I was looking for! I love the pink because it is very playful and fun, compared to usual darker shades such as grey or navy. Younger people can sometimes shy away from tweed in fear that it will age them, but you can find tweed in different colors and can style it so many ways, proving it is great for any age! The bubblegum pink is also mixed with pastel pinks and white to create a cute combo of color that reminds me of cotton candy—definitely a spring mixture! Aside from the flirty color, the cropped style is very fresh and allows you to style it with high-waisted jeans or a skirt, like me. Lastly, it is pretty hard to ignore the gorgeous jewel buttons that adorn the front of this piece. The flower details are feminine and add some bling because sparkle never hurt anyone! The buttons make this $100 jacket look so much more expensive and luxe. By now, you probably see the need for tweed because it is so versatile. Comb those closets and look for unique pastel tweeds that are perfect for spring (but if you happen to stumble upon dark tweed, tuck it away for some chic fall outfits)! To stick to the pink theme, I threw on a simple pink v-neck tee under my jacket. Don't be fooled by the myth that tweed is only for fancy occasions and needs to be worn with formal pieces because the truth is, you can dress it up or down! I like to keep things semi-casual for class and day-to-day life, so that is why a t-shirt is such a fitting option. Everybody has a tee lying around, and a cotton shirt is amazing for layering under jackets because it keeps you cool. I chose more pink because I really wanted the bubblegum flecks of the tweed to stand out, but you can also wear white or experiment with a pale yellow, lavender, mint green, or baby blue shade that will complement the pink. For the office, you can even opt for a chic button-down shirt, or wear a satin cami underneath for a date night look! It is no secret that I am a lover of skirts, so it is not surprising that I wanted to slip one on with this tweed jacket. For the most part, my style is very girly and skirts make up a good portion of my wardrobe! Jeans are great and all, but I honestly find skirts and dresses to be much comfier, especially when they are an A-line style like the one I am wearing. I chose a black skirt to match the black jewels on the buttons of the jacket, and the white stitching ties in with the white and pink tweed. This skirt is so cute, though, because it is not your average black skirt; it has big old buttons and contrasting thread that gives it all kinds of character. The button front style is an interesting touch, and the buttons are actually functional, but very secure (i.e. no wardrobe malfunctions). White contrasting thread accentuating the stitching is also a unique feature that I don't often see when shopping for black skirts. I love the tie waistband because it is paper bag style, meaning that the top ruffles out a bit. Paper bag waists are very fashionable and on trend! I love this skirt so much, and I know I said that the buttons never caused me any problems, but if you are in need of a laugh, then listen to this; This skirt is a very light polyester material, and I recently wore it to class with a denim jacket over it. Well, between the crazy wind, my backpack, and the thick denim against the thin fabric, I believe I gave people at my college a bit of a show! I'm not quite sure how far my skirt rode up, but it is probably best I don't know! This is why I never leave the house with out wearing compression shorts underneath my skirts and dresses! Don't let my funny mishaps discourage you from wearing a skirt—just don't forget the undershorts (and maybe look at the weather forecast too, haha)! One of the reasons I am excited for warm weather is because I love my mules! 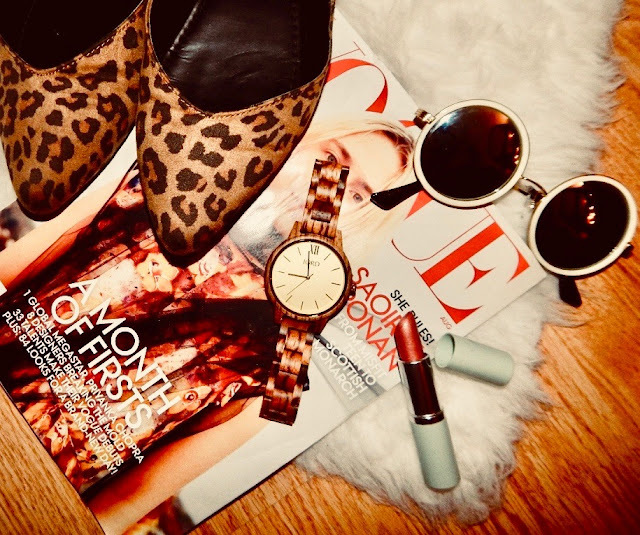 They are by far some of my favorite pairs of shoes because they are easy to slip on and make every outfit look chic. I know you have seen these before, but this is their first time out in 2019 and I am so thrilled to be walking in them again. A white mule is great for the season because they go with all sorts of spring and summer outfits. Mules are popular because they look more professional/dressier than a flip flop, but they are just as easy to throw on and head out the door. I have worn these shoes all day on multiple occasions, and if they are comfy enough for me to tackle an 8 hour shopping trip (trust me, my shopping trips are quite intense), then it is safe to say that you can conquer the world in a good pair of mules! You can get ones with fringe and metal accents like mine, or try for a sleeker, more minimalistic pair. If you prefer the mule animal over the shoe, then you can add some sporty flair with a sneaker, or try a white patent leather bootie for extra cool! I wasn't going to post this last picture because the colors were just not working, but I didn't balance on this pavilion for 20 shots for nothing, so here we are! Sometimes the perfect poses are the ones that never seem to work out, and the pictures where I am caught off guard are my favorite! Anyway, I hope you enjoyed this look that feels like a step in the right direction towards spring and summer fashion. 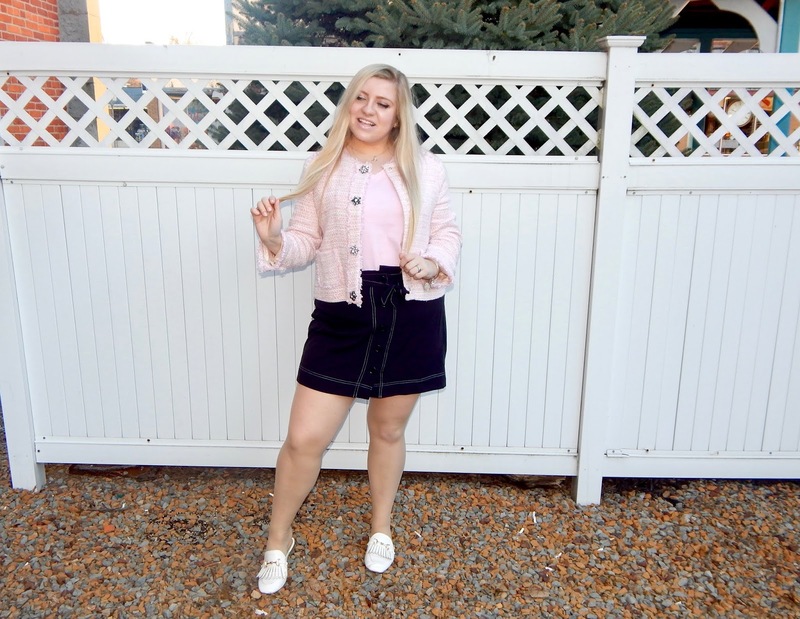 You may have noticed that my inner Elle Woods came out in this outfit because, "Whoever said orange was the new pink was seriously disturbed." Do you guys love the movie, Legally Blonde? Let me know your favorite Elle moment in the comments! 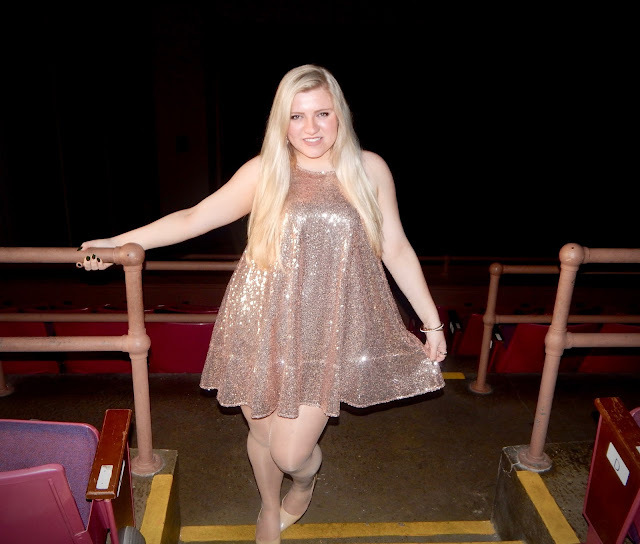 I have actually been told that I am like Elle Woods and that is one of my most memorable compliments! Fun fact: Elle studied fashion merchandising before she went on to law school, and I am currently a fashion merchandising major too! Who knows? Maybe I will end up at Harvard someday! For now, I will stick to my fashion at IUP! Remember to comb those closets for timeless tweeds in spring hues, as well skirts and mules. If you are too busy spring cleaning or catching up with Elle, then just shop my links below! Have a fabulous week, and Happy Closet Combing!